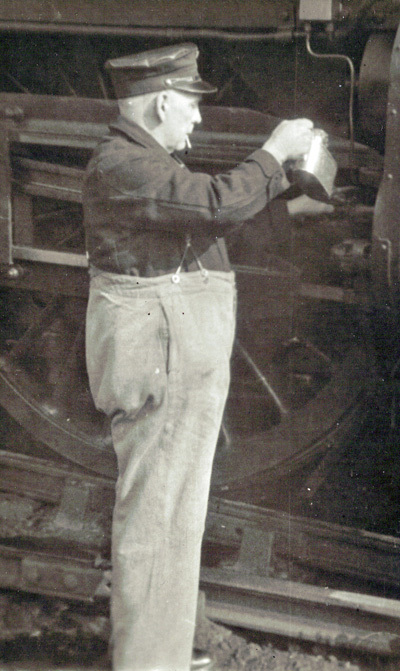 Ted Crocker was a railwayman who worked for 46 years with the GWR & BR. 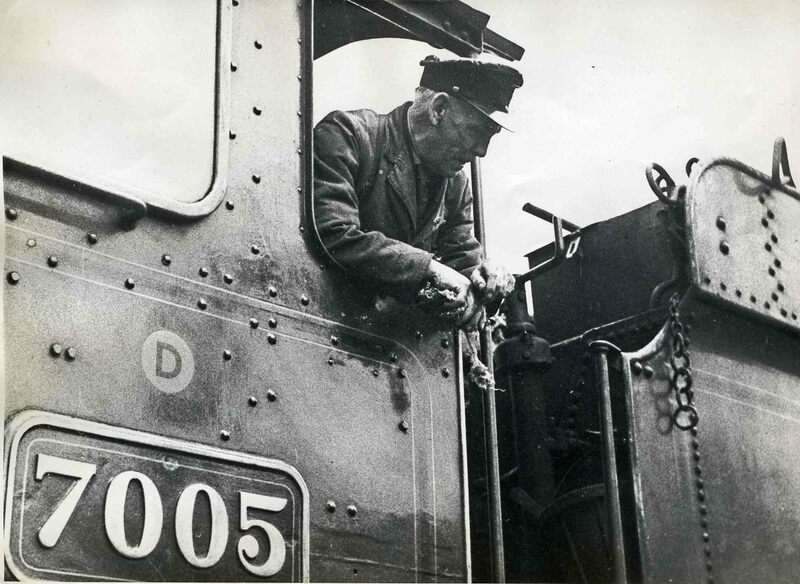 He retired in the mid 1960s having previously driven express locomotives on the line from Worcester to Paddington. By courtesy of his son, John, the MIAC has been given exclusive access to Ted Crocker's photographs. The MIAC has not seen any of these photographs in commercial publications but would welcome any information that would enable the photographers to be contacted. 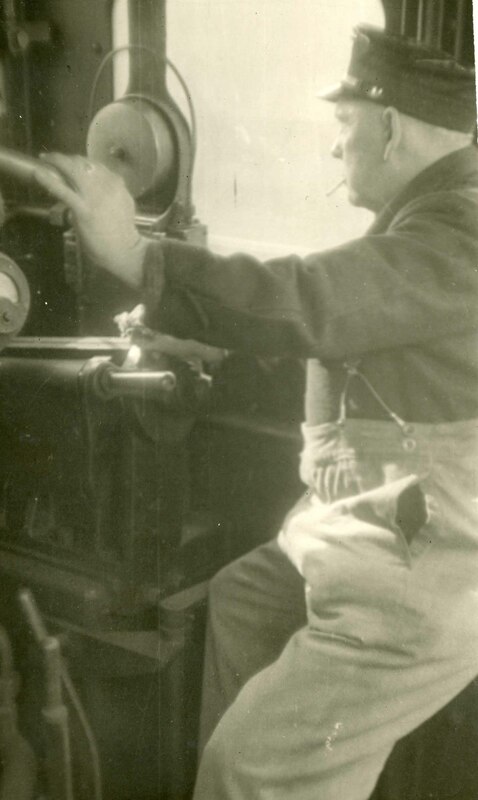 This photograph shows Ted Crocker seated on the footplate of 4-6-0 'Castle' class locomotive No.5063 'Earl Baldwin''. The photograph which may date from the early 1950s states on the back that it was taken whilst passing through Reading at 86mph on the 09:10 Worcester to Paddington. This photograph by an unknown photographer (it is captioned 'Driver' on the reverse) shows Ted Crocker presumably awaiting the right of way with 4-6-0 'Castle' class locomotive No.7005. There is no date on the photograph but is probably from the late 1950s by which time No.7005 was named 'Sir Edward Elgar'. 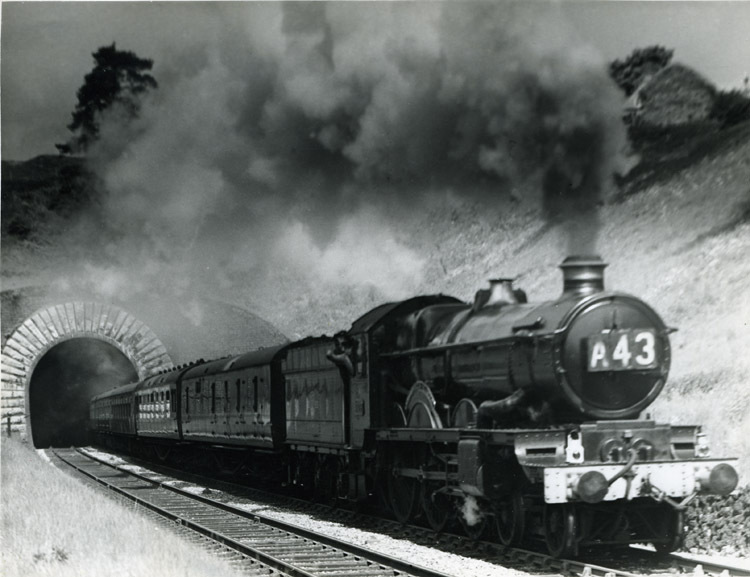 In this magnificent study Ted Crocker can be seen waving to the photographer as his express train emerges from Campden Tunnel on an 'up' express. The locomotive is a 'Castle class 4-6-0 in a spotless condition as typical of express engines at Worcester' in the 1950s. Sadly no further information is available as to the identity of the master photographer who took this picture. The locomotive is a single chimney 'Castle' and possibly is one of the later 70xx series. Martin Street advises that 'with regard to the new photograph on the website of a Castle leaving Campden Tunnel. The A43 headcode would make it a 60s shot as the A prefix only came into use in early 1960. In my 1960/61 working timetable the 1A43 is a Bristol train but in my summer 63 version 1A43 is the 10.05 Hereford-Paddington and I would imagine this is the working photographed'. Robin King adds "I have just discovered your fascinating photographic archive of Worcestershire railways. I grew up in Worcester and Harry Cureton (Shedmaster in the 1950s) lodged with my grandmother during the week. (His home was at Tyseley.) My father, brother and I regularly were shown around the shed and the works and Harry often also arranged for us to visit other sheds in the Worcester division and Stafford Road, Oxley and Tyseley. "You have a section of photographs entitled The Ted Crocker Collection. Mr Crocker lived next door to a friend in Wylds Lane and he told us of the time he drove Princess Margaret. The unknown Castle he is driving emerging from Campden Tunnel is No.7007 'Great Western'. The number is just distinguishable, but the giveaway is the GWR crest below the nameplate on the middle splasher. This loco was one of the favourites of locomen at Worcester. Perhaps, as it was the last GWR express engine to be built, extra-special care was taken by the builders at Swindon." Finally we do know a little bit more about this rather faded study of 4-6-0 'Castle' class No.7006 'Lydford Castle' which was based at Worcester from September 1960 until March 1962. 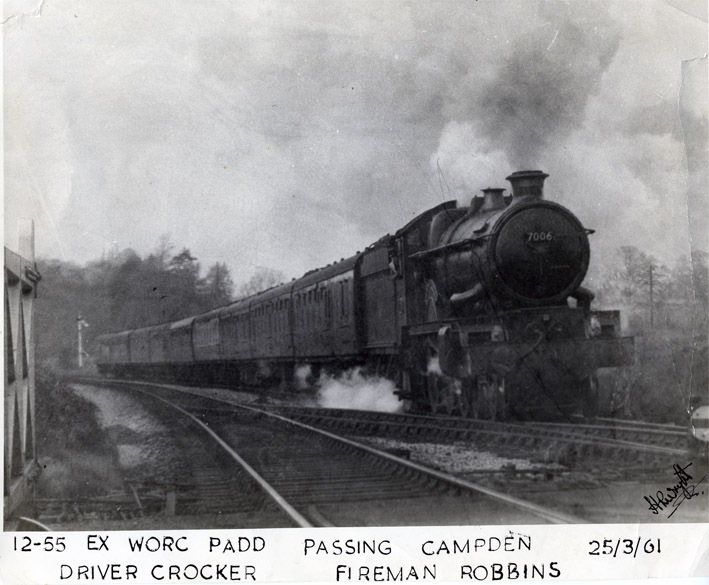 Again Ted Crocker can be seen on the footplate. The legend on the reverse of the photograph states that weather conditions prevented a first class result. The train's speed was about 35mph and the photograph was taken using a Zeiss Tessar camera at 1/300 at f4.5 on Kodak P.1200 film. The photographer has signed on the front; this is unreadable but is possibly H.W Wright.. 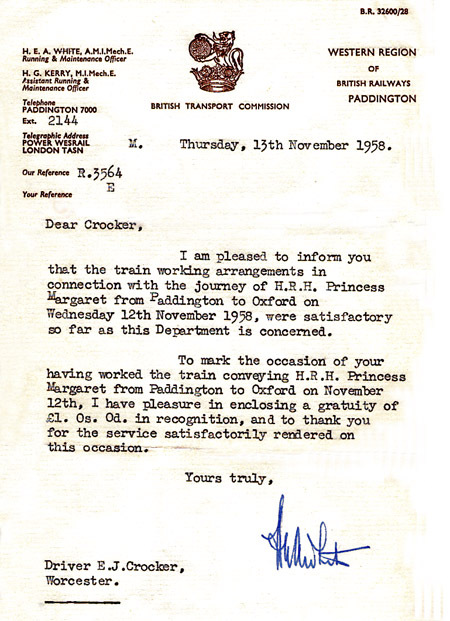 This letter from the offices of the Western Region thanks Ted for recently working the Royal Train. This photograph is a bit of mystery that we hope one of our readers may be able to solve. Ted Crocker has his arm an ex-GWR Railcar (number unknown) on the "RRE Malvern, Boffin Special". 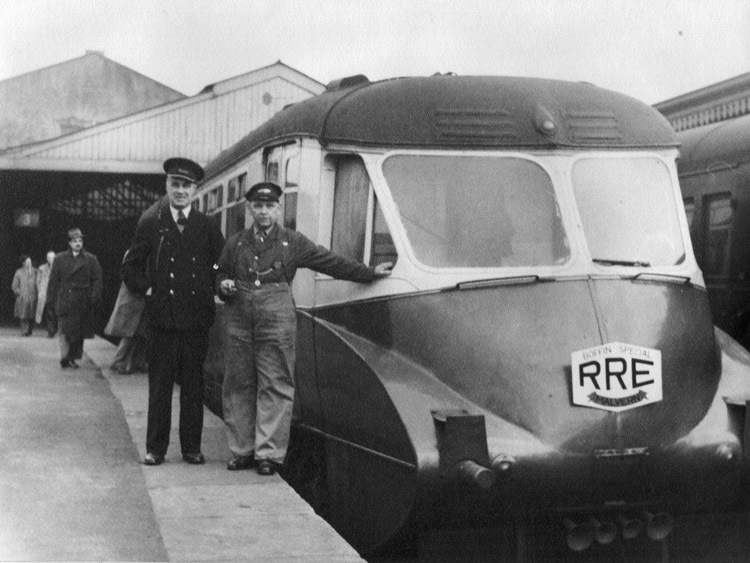 Clearly taken after the Queen had renamed the TRE to RRE in 1957 but the location and photographer are mysteries. This is Ted again with the oiling can and an unidentified "Castle" class 4-6-0. 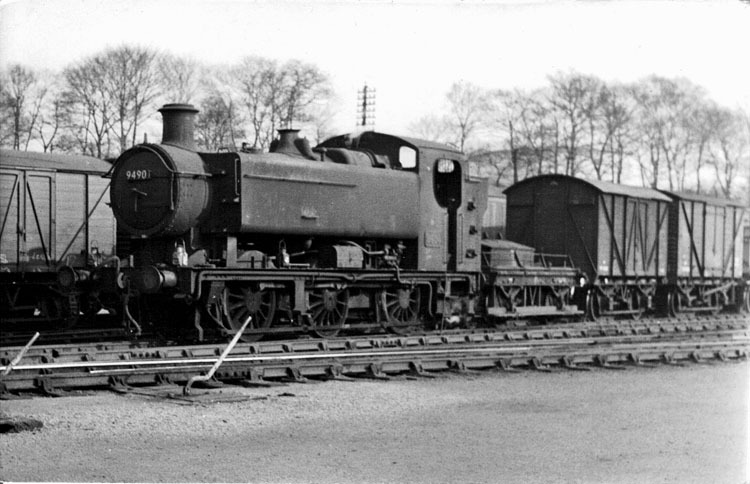 This photograph shows 8400 class 0-6-0 "Pannier" Tank No.9490 of Worcester Shed in the yards at Worcester. The date on the rear is shown as 23/3/1960 but the photographer is not identified. Apparently by the same photographer as No.9490 above this shows a Hawksworth designed 1500 class 0-6-0 Pannier Tank No.1507 at Worcester Shrub Hill. 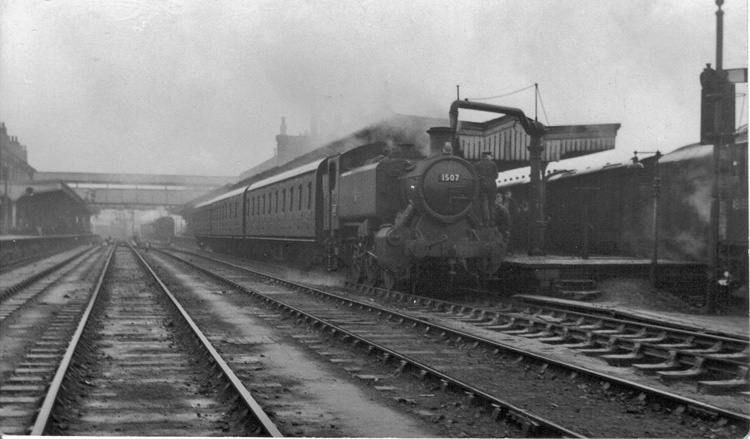 On the rear of the photograph is states that the train is the 10:15 Wolverhampton-Worcester-Leamington local on 19th June 1961. We recall possibly having seen a photograph very similar to this many years ago but can find no trace of it in our library of railway books. Any information to help identify the copyright holder would be most welcome.